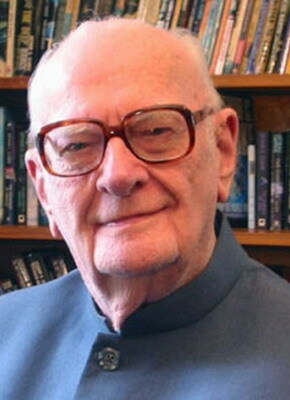 Arthur C. Clarke C.B.E., was the author of more than seventy books of popular science and science fantasy, including Childhood's End, The Nine Billion Names of God, Rendezvous with Rama, and Profiles of the Future. His "Mysterious World," "Strange Powers" and "Mysterious Universe" television programs have been broadcast worldwide. Clarke, a graduate and fellow of King's College, London, has been chairman of the British Interplanetary Society, a council member of the Society of Authors, a vice-president of the H. G. Wells Society, and is a member of many other scientific and literary organizations. His numerous honors include several doctorates in science and literature, the Gold Medal of the Franklin Institute, the Marconi Fellowship, the Charles A. Lindbergh Award, the UNESCO-Kalinga Prize, the Distinguished Public Service Medal (NASA's highest civilian award), and the Special Achievement Medal of the Association of Space Explorers (the astronauts' and cosmonauts' exclusive organization). His screenplay for 2001: A Space Odyssey received an Oscar nomination in 1968. He has had long-time interests in underwater exploration and is a director of the Colombo-based Underwater Safaris. In 1989, Queen Elizabeth II awarded him a Commander of the Order of the British Empire for his "services to British cultural interests in Sri Lanka." In 1994 he was nominated for the Nobel Peace Prize for his 1945 insights that led to the development of orbiting communication satellites. Since 1995, he had been largely confined to a wheelchair by post-polio syndrome. On 18th March 2008 at 0130 local time (2000 GMT), he died of respiratory complications and heart failure, according to his aide, Rohan De Silva.